"Your ear won't know where to tune in: to Jarrett's dazzling jagged runs (that years later show up in Mike Garson's 'Alladin Sane' Bowie accompaniment), or DeJohnette's driving cymbal work or McBee's muscular playing on his 'Song of Her' or the rousing concluding piece, a speedy take on the standard 'East of the Sun,' which the group takes apart and then gleefully re-assembles much to the crowd's delight. Lloyd's fleet playing is an album standout. ... Kevin Gray's cut is far superior to my original Atlantic pressing, which despite all of the Dual 1009SK/Shure V15 plays, remains quiet and fully extended on top. However, this reissue is far more dynamic and far better EQ'd, especially in the far more transparent midrange that also manages to well convey the outdoor space." — Music = 10/11; Sound = 09/11 - Michael Fremer, AnalogPlanet.com. Read the whole review here. 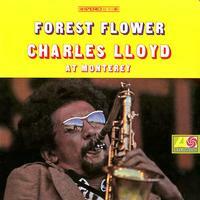 It was a clever move by George Avakian, producer at Atlantic Records, to record live the Charles Lloyd Quartet during their appearance in Monterey, and to release the LP under the title Forest Flower. Although the hippy flower-power movement tended towards a rather different musical genre at the end of the 1960s, they were blown away by this music. The four artists attracted masses of people and ensured that every seat was taken and all standing room filled at jazz festivals such as Newport, Molde (Norway), Antibes (France) and the Fillmore East and West. The super group also appeared in Monterey, 120 Km south of San Francisco, the centre of the hippy movement, on 18 September 1966. On the LP we have the almost 18-minute-long title piece and the standard work "East Of The Sun," which were recorded at the festival. The disc is complemented by a Keith Jarrett composition and one by Cecil McBee, both of which were recorded in the studio ten days before the festival. Of particular note is the rich interplay, the energy that is palpable throughout, the perfect harmony in each and every change of mood, and the intensity. Even 50 years later, it is quite clear that Charles Lloyd managed to break down the barriers between pop and jazz. Charles Lloyd is committed to this objective to this very day! All four musicians are still active, although they no longer appear together as a group. Such a special treat for the ears is offered by this newly-mastered disc only.